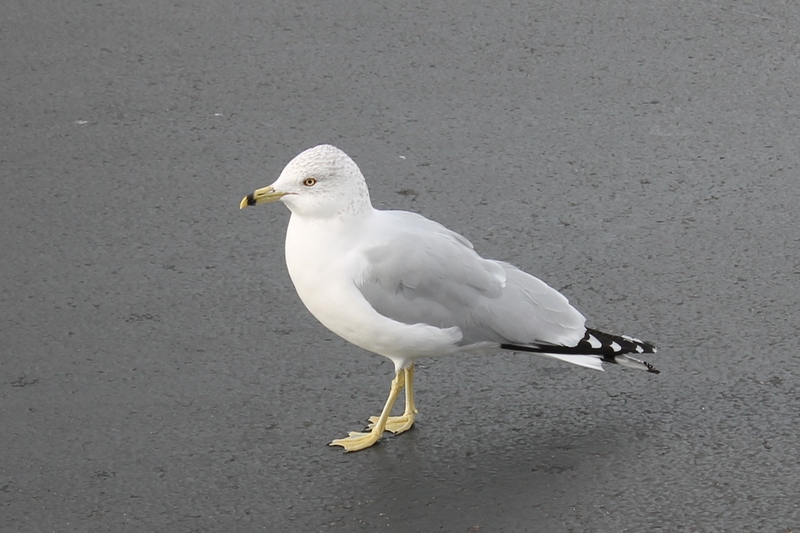 Recently I went to a shopping center where I had seen gulls last year. They had been in perfect plumage, but seasons changed before I could get back up there to take the picture. I wanted that picture, so I made a point of going back this year. Upon arriving all I saw was a few gulls on top of the lightposts. These were at a lousy angle for pictures, but with the help of a few french fries I managed to perform a couple of miracles. Not only did I pose the birds in exactly the best location and lighting, I also managed to produce about three times as many birds out of thin air. I have no idea where all those birds came from. This is my favorite picture out of the set. When I got home to sort out the pictures I took a moment to verify my lovely picture of a herring gull. Rememeber I had been anticipating this shot for almost a year. When I checked the field guides, I quickly realized it wasn’t a herring gull at all. This is a ring-billed gull. Instead of telling you about the bird, let me tell you about the mistake. There are a variety of gulls, but here in my area there are only a couple of species. It was a lot of years ago that I had identified these gulls and sorted out the field marks. Since then I had simply forgotten. When I saw a bunch of similar gulls I quickly assumed that they were the herring gulls because herring gulls are the most common gull in many, many places. I don’t live in one of those places. In the meantime, when I read birding magazines, websites and books they constantly mention herring gulls as the common junk bird of gulls. This would happen with all the reading material except the field guide, It, of course, always gets the details right. When I mistook the ring-billed gull for another it was a shame. After all the ring billed is so much more spectacular than a herring. Notice the yellow eye, the fine streaking on the head, and the very unique color of the legs that defies description. Those legs are neither white, gray, yellow, pink, green or any other color commonly named, while managing to be close to all of them. But despite the shame of it, ultimately my mistaken identity was no big deal. What is a big deal is when a believer decides that he knows everything already and steps back from Bible study. They have a general idea of what the Bible says because once upon a time they studied it. What they don’t know is which of their memories are fading, or being replaced by common theology. What I call common theology is the ideas every man on the street believes is Christian doctrine, only a lot of it is wrong. Since we are all still in contact with media and culture, we are likely to begin to buy into this common theology if we are not regularly countermanding their falsehoods with the truth of God’s Word. So never decide you know enough of the Bible. Churches have Bible studies for every age range because we all need to be anchored to Scripture and will drift without it. I am a white, male, evangelical Christian; no one cares if I am offended. Yet I want to address one of the most offensive things I have seen lately, the publicity for the Queen James Bible. It is touted on Facebook right now as a new attack by liberals on Christianity. That is not exactly true, looking on Amazon you can see that this corruption of Scripture was released back in 2012, so it’s not new. Nor does it appear to be an organized attack. It is nothing more than one person’s attempt to promulgate their lifestyle and to profiteer from other people’s foolishness. I wish Christians wouldn’t fall for misinformation so easily. But more so, I wish the lost world would not fall for the lies that lead to whitewashing sin and to eternal separation from God. What I referred to as highly offensive was not the exaggerations about the book presented on Facebook, the most offensive thing was the lies told in the sound bites promoting the book. Here is an exact quote. Homosexuality was first mentioned in the Bible in 1946, in the Revised Standard Version. There is no mention of or reference to homosexuality in any Bible prior to this – only interpretations have been made. So they would have us to believe that up until then the Bible was either silent on homosexuality or in favor of it. This is a blatant lie, empowered by the fact that his intended audience would not take the time to check the details. Let me tell you the truth, with some easily verifiable facts. The King James Bible was produced in 1611. This of course means it was written in old English. It is generally sold with updated language, so that the 1611 spellings are highly unlikely to be what you find in a local library or bookstore. In the original wording, without any updates Romans 1:24 ff is very clear, even if it is in old English. Homosexuality is a sin, and it is a sin that grows out of rejecting God and which brings about appropriate consequences. (Here is a link that will allow you to search any passage in the 1611 King James.) Here is the exact copy. 25 Who changed the trueth of God into a lye, and worshipped and serued the creature more then the Creatour, who is blessed for euer. Amen. 27 And likewise also the men, leauing the naturall vse of the woman, burned in their lust one towards another, men with men working that which is vnseemely, and receiuing in themselues that recompense of their errour which was meet. The passage doesn’t use the word homosexuality, but it describes homosexual behavior clearly, and there is no honest way to say this passage does not condemn the behavior. People who are justifying their sin do not mind lying about what the Bible says. In essence they are described here as the ones who “changed the truth of God into a lie.” In this case they went so far as to rewrite the Bible. God created humanity in such a way that we all make our own choices, and pay the price for our choices. One of the most offensive things I can imagine is lying to people about the consequences of their actions. Sometimes I notice I have trouble talking theology with people who are accustomed to thinking of theology only in categories. For example, I am aware that I am not exactly a Calvinist. For a lot of people their immediate response to this is to assume I must be Arminian in my beliefs. This is false. I am even further away from Arminianism. In my way of thinking about theology it is perfectly fine to have a belief system that is somewhere in the middle. But it seems as if a lot of people, believe this is cheating, somehow. It is as if the men, for whom these theological systems are named, are such icons that we are obligated to accept or reject everything they say as a unit. Perhaps we are supposed to submit to their wisdom, assuming they are smarter than us and whatever they say fits together as a cohesive system must be accepted in total. For some, theology is a zone where you are not allowed to think for yourself. Instead you are obligated to study, discuss and choose your belief based on the historic categories used to teach theology. This doesn’t work for me. Not only do I like to think for myself, but what makes the most Biblical sense to me, doesn’t fit exclusively into one of the traditional categories. It appears to me to be a clear, sensible, tight fitting system, and I am perfectly fine that it doesn’t fit any previously defined mold. So don’t limit my theological discussions to the framework of others. Instead let me describe my own beliefs. Hear what I say, rather than only looking for what historic views my discussion resembles. I expect that the best ways of discussing God’s character, actions, and redemptive work, may be yet to be composed. Perhaps, our conversations will give birth to a new paradigm, but only if we allow ourselves to think outside of the historic boxes. Of course, we can never set aside Scripture, reverence or God’s deity, but there is still a lot of room for discussion. Christians say that the Bible is inspired by God. It is a concept drawn directly from Scripture, but what exactly does it mean? It is one of the more subtle questions of theology, but also one of the most important. There are a number of different viewpoints on exactly how inspiration plays out. I personally believe it means that God chose every word of the text of Scripture. He literally wrote the words of the Bible through the human authors. But then again, that is why it is hard for us to figure out. There were human authors. Individuals who wrote things, probably not thinking they were particularly special at the time. These individuals have a multitude of ways in which their personalities and style comes through in the portions of Scripture they wrote. But does that mean, God is out of the picture? I don’t think so. Assuming the variety of human voices in Scripture, excludes God, is equivalent to assuming God is very small. God who created each one of those human beings instilled into them their unique traits. Why would we believe God is big enough to create all those different persons, but not big enough to use and speak through each one uniquely?